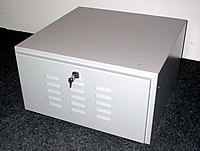 Computer cabinet for security and protection of computer hardware, sealed to IP54 or IP65. Most computers are designed to sit on desktops. Put them in a factory, warehouse, chemical plant, food processing plant or any other harsh environment and your asking for trouble. Breakdown, loss of data, the need to replace equipment…it can be an expensive business. Computer protection using PC Guard is the cost effective way to extend the life of a standard Tower or Desktop Processor unit in hostile situations. PC Guard Computer Processor Unit is fully assembled, with all doors, locks and fan. So you can install and be using your PC Guarded processor within minutes. 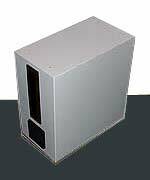 Why use Stainless Steel Enclosures for computer protection?